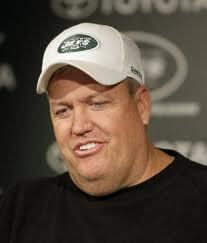 Let's face it, Rex Ryan not only talks the talk he walks the walk. The last second comeback against the Indy Colts merely cements his reputation as the most exciting, and perhaps, best coach in the NFL. Two years ago it would have been he same old Jets if they were in the same situation with the Colts. He has changed the dynamic of the team forever. He may be on his way to legendary status. We looked for another Namath but he may be on the sideline, not on the field of play. Ryan has the same operatic qualities as Namath, every thing about him is larger than life. Now he has the perennial NFL losers really thinking they can win. I was one of millions ready to write them off after they gave Manning the ball back twice in the closing moments. How often have we seen that script with Manning leading his team down the field to victory. Bt somehow this scrappy Jets team found way to finish it. The TV shot of Fireman Ed raising his helmet to the heavens said it all for Jets fans. New York loves a winner and they seem to have found one. But no doubt Tom Brady would disagree.